KENNEBUNKPORT, Maine -- Two former presidents gathering in Kennebunkport, Maine, weren't father and son. They were Republican and Democrat, and former competitors. Former Democratic President Bill Clinton visited Monday with former Republican President George H.W. Bush at his home on the coast. 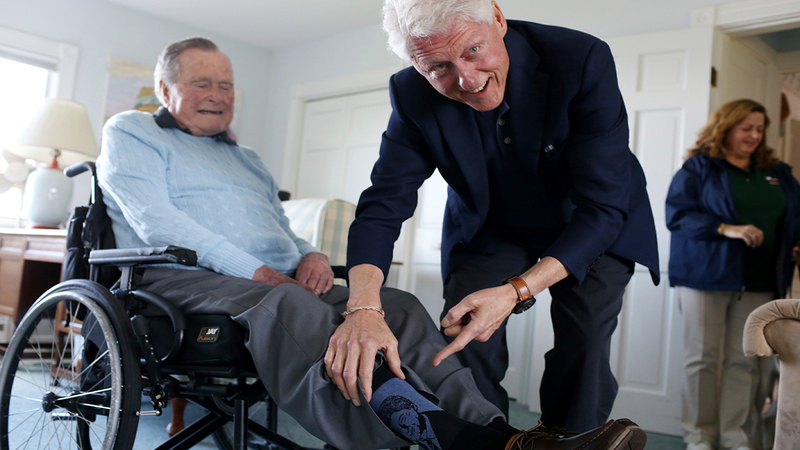 A photo posted on Twitter shows the nation's 41st and 42nd presidents sharing a moment as Bush shows off a pair of "Bill Clinton socks." Clinton ended Bush's plans for re-election in 1992 but both Bush, and his son, former President George W. Bush, are now friends with Clinton. The elder Bush enjoys wearing colorful socks and wore socks with books on them to honor his late wife's commitment to literacy at her funeral. Barbara and George Bush were married for 73 years before her death on April 17 in Texas.